Two cosy bedrooms, equipped with a wealth of thoughtful extras, are available - one double, with en-suite facilities, and one super-kingsize/twin, with its own private facilities. For more details of each room and the prices click here. Children aged 12 (+) are welcome. We regret that we are unable to accommodate pets. Please note that we are a no smoking house. The breakfast menu includes smoked salmon with scrambled eggs, home-made preserves and freshly baked bread. Click here to see the full menu. Our B and B is walkable to The Plough, with a nice pub atmosphere at one end and a pleasant restaurant atmosphere, with good food, at the other, and to the Black Dog (under new management). The Ring of Bells is in the next village. There are also many other excellent pubs and restaurants within easy driving distance. Your host, Jane, is very knowledgeable about the area and will be pleased to advise you on local attractions and events. She also speaks French and German. Take the junction past Junction 12 on the M53 signed Whitchurch (A41). Take the right hand lane on the slip road and take the third exit towards Chester. At the next junction filter left (A41) and in a quarter of a mile at the big junction with lots of lights keep left and follow the A41 for Whitchurch. You will pass the Old Trooper pub on the left, then the Cheshire Cat (approx. 1.5 miles). After the petrol station turn left along Moor Lane. At the Post Office turn left into Eggbridge Lane. Go over the Canal bridge. We are number 9. You should see the B+B sign. If you get to the shops you have gone too far! At the staggered junction ( 200 yards ) you will see the White House Antique shop on your right. Turn right here onto Eggbridge Lane. The Old Farmhouse is on the right over the Canal bridge on your right. You should see the B+B board just before the sandstone gateway. 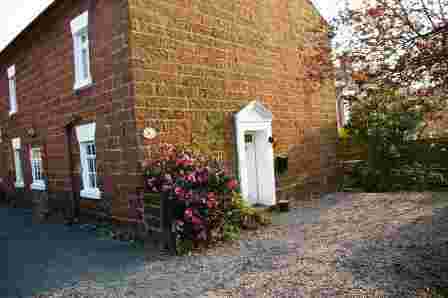 Located in a small village just three miles south of the historic city of Chester, The Old Farmhouse is an ideal base from which to explore the area. The 'Park and Ride' facility into Chester is a few minutes away (click www.visitchester.com for details of Chester's attractions), as is the beautiful Shropshire Union Canal. The city walls, dating from Roman times, take 1 1/2 hours at a leisurely pace to walk around. En route you will pass the famous Eastgate clock, the Roman gardens, the river-bank, the oldest racecourse in England, the King Charles' tower from where the ill-fated monarch watched the Battle of Rowton Moor, and the Cathedral, a place of worship since 992. The black and white Rows (two-tiered medieval shops with covered walk-ways) are unique to Chester and in summer the Town Crier greets visitors at the Cross at Mid-day. The Zoo is world famous and the largest garden zoo in Britain. Chester is also the ideal base for visiting North Wales with its castles, beaches and mountains and the Wirral peninsula with the Ness gardens and The Lady Lever Art gallery. The Old Farmhouse is a delightful 18th century building. Built circa 1750 it only ceased to be a farm in 1963. A road-bridge was built over the canal in 1770 so the Egg farm would not be cut off from the main road now known as the A41. Thus Eggbridge Lane was named! A warm welcome to this AA 4-star rated house from your host, Jane, is assured, with tea/ coffee being served in the lounge or on the patio on arrival.